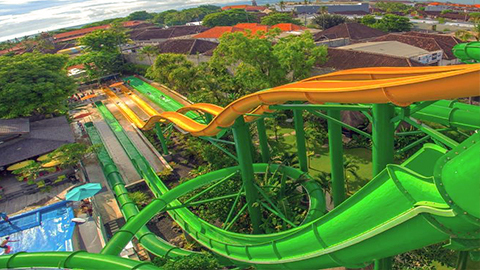 Waterbom Bali is the best waterpark on the island of the gods. Known as a tropical paradise full of palm trees, sandy beaches and volcanoes Bali is a small island surrounded by some of the most beautiful beaches you will ever see. …but if you’re looking for fun Waterbom is the place to be. With 16 different attractions Waterbom is a non stop heaven for kids and big kids at heart. Whether you’re an adrenaline junkie seeking the ‘Climax‘, feel like practicing your surfing skills on the ‘Flow Rider‘ or just want to float down the ‘Lazy River’, Waterbom has something for everyone’s tastes. With your own private Gazebo you can unwind and relax whilst the staff cater to your needs. With food and drinks delivered straight to your gazebo and a safe to secure your belongings you can rest assured and feel comfortable knowing your in good hands. For people not wanting to hire a gazebo there are three other locker sites throughout the park you can feel comfortable knowing your belongings are safe. Simple, keyless entry with your splash band ensures speedy and secure access. Towel hire is also available for Rp10,000 per towel. Set in the heart of Kuta, Waterbom is only a short stroll from Kuta Square and Kuta beach which makes it easy access for everyone. Need tickets? You can get them HERE.